A simple greeting of gratitude, is just what mom wanted. To all Moms, Happy Mother's Day. Thanks Shaunna, That was one I did last year. I also have a longer version, but I couldn't get the scrolling just right. That is real nice, Ross. Yes... 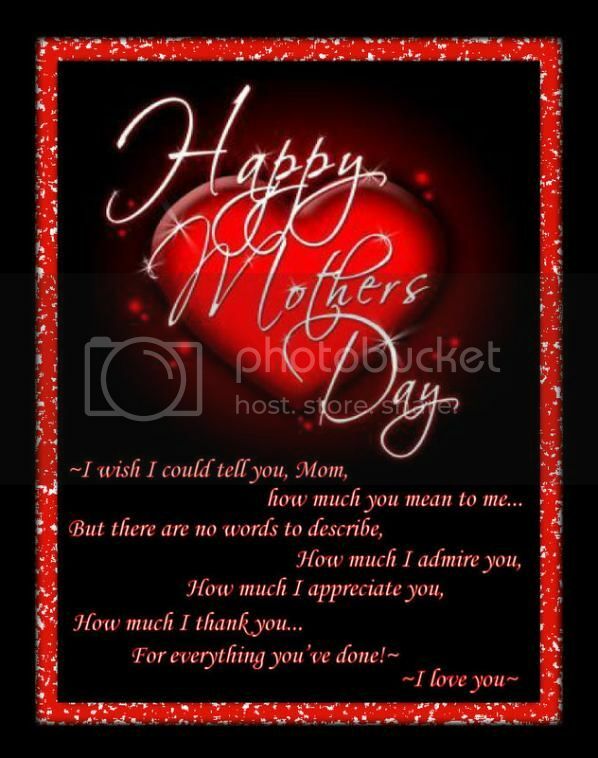 Happy Mothers Day to all those wonderful Moms who are here, are now gone and are yet to come. What a sweet gesture. Thanks so much! It is my first Mother's Day without my Mom and my daughter is trying so hard to make it special. God bless her! My daughter is on her way to the hospital right now to have her baby!!! What a great Mothers Day this is going to be! How totally cool for you! My daughter was born on Mother's Day as well, many moons ago! Happy Mother's Day to all the wonderful ladies. Congrats Grandma!!! btw, Happy Mother's Day!!!! It is my first Mother's Day without my Mom and my daughter is trying so hard to make it special. I was born on Mother's Day.... fun when it coincides every now and again.... gonna be a cool mother's day pressie... keep us posted will ya? My daughter Sarah had her baby at about 3am, so it wasn't quite on Mothers Day. She was in labor for about 10 hours from start to finish and had a healthy baby boy! His name is Richard. He weighs 8 pounds, 10 ounces, and is 23 inches tall. Mommy is tired but happy, and I am very proud of her! Congratulations to Daughter X and to Richard...Happy Birthday! *doc places Richard on the birthday list . Thanks Doc, thanks Syd! I'm a happy gramma! Hehe, I kinda like that. Congrats Xiandi! Same goes for the new Mom and Dad!